Bequeathed by Sir Henry Cole K.C.B. The Council Medal was presented to only 170 exhibitors in the Great Exhibition of 1851. The Royal Commissioners set up a Council of Chairmen of the Juries who had the decision on which recommendations from the Juries would receive this most exclusive award. Medals were presented alongside a decorated certificate signed by Prince Albert and illustrated with detailed engravings of the medal design, and a bound copy of the extensive Juries’ reports on the exhibits. This is one of five official award medals designed for the exhibition, presented on behalf of Queen Victoria. They were struck in bronze, the metal considered most appropriate for the development of superior skill and ingenuity in medallic art. This reflected the Great Exhibition’s mission of promoting British manufacturing through encouraging excellence in industrial design, and developing public taste. The design on the reverse and the quote on the medal’s reverse, reflect the aspirations of the ‘Exhibition of the Works of Industry of All Nations’; the event was promoted as a truly international cultural showcase, and a collaboration between nations, in which Britain could demonstrate her prowess. This example forms part of a magnificently bound presentation set of seven medals given to Henry Cole, all inscribed with his name. Henry Cole was Prince Albert’s Chief advisor for the Great Exhibition of 1851 and involved in all aspects of its concept and execution. 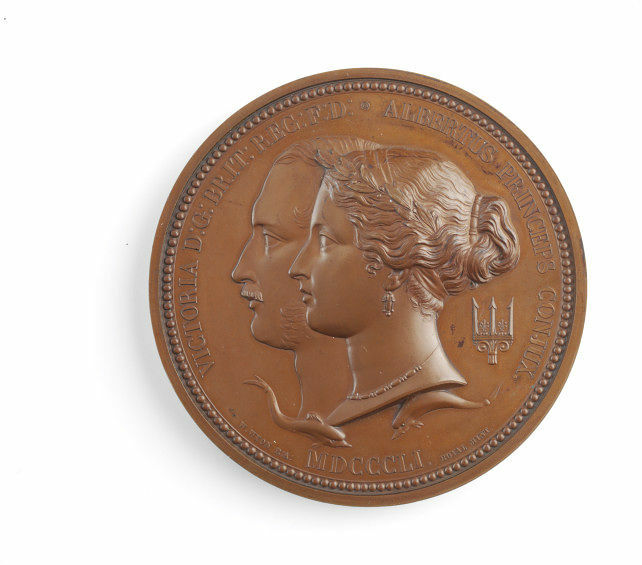 Bronze medal with obverse depicting conjoined profile busts of Queen Victoria and Prince Albert, facing left. Two dolphins sit below the busts and a trident to the right, representing Britain's naval power. Victoria wears a laurel and jewellery. Beading decorates the rim. The reverse design and inscription proclaim the British Empire's strength in trade and manufacturing: The crowned figure of Britannia stands in classical robes with arms outstretched. She holds laurel branches above the figures of Commerce (in the guise of Mercury, the Roman God of Commerce) and Industry, who shake hands below her. Surrounding the dais are artefacts of trade and industry, including a bail of cloth, a cogged wheel, a shuttlecock, an anvil, and a ship and anchor. Behind Britannia stand the flags of many different nations. The Council Medal was the most prestigious prize award conferred for The Exhibition of the Works of Industry of All Nations of 1851, known as the Great Exhibition, and was only awarded to around 170 of the ca. 17,000 exhibitors. 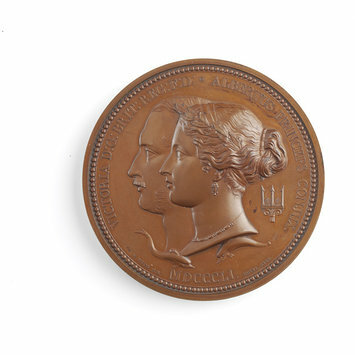 It is one of the five official award medals designed for the Exhibition, to be presented in the name of Queen Victoria by the Royal Commission (established in 1850 by Queen Victoria to organize the Great Exhibition of 1851, and actively presided over by HRH Prince Albert). The medals were struck in bronze, the metal considered most appropriate for the development of superior skill and ingenuity in medallic art. This choice reflected the Exhibition’s objective of promoting British manufacturing through encouraging excellence in industrial design, and developing public taste. To distinguish it from the Prize Medal, The Royal Commissioners instructed the Juries and the Coincil of Chairmen of the Juries that the Council Medal should be awarded for 'some important novelty of innovation or application, either in materiel, or process of manufacture, or originality combined with great beauty of design; but that it should not be conferred for excellence of production or workmanship alone. They were awarded alongside a decorative certificate illustrated with detailed actual size engravings of the medal design, and an Octavo (small) copy of the extensive Juries’ reports on the exhibits. Manufacturers and Artisans valued the medals for their prestige and for advertising purposes. The Great Exhibition was split into four main groups of exhibits reflecting the different stages of industrial production: Raw Materials; Machinery; Manufactures and Fine Art. An elaborate system of Juries was established and overseen by the Royal Commission and the award decisions were brought before ‘Groups’ and the Council of Chairmen, who attended meetings and advised on the award principels established where clarification or guidance was needed. The Council medal is so named because the Council of Chairmen. It is made clear in the published Commissioners Report, and the introduction to the Reports of the Juries, that a rigorous and impartial system of prize awards for exhibits, based on merit, was considered very important, and a great deal of work was put in to strive to make it as fair as possible; this was to ensure a high level of prestige surrounded the awards, and that they reflected and encouraged the organiser’s ideals in manufacturing and design. Ensuring half the Jury members were from the 33 foreign countries exhibiting validated the international status claimed for the Exhibition. Instructions to the Juries show that the Council impressed they were very keen to ensure the most impartial distribution of prizes. Although initially a prize fund of up to £20,000 was allocated, money was soon rejected as the principle award system for the Great Exhibition, as was a traditional system 3 tier system of medal prizes, such as those used in the French ‘Expositions’. The Juries complained it was unfeasible to judge degrees of merit in exhibitors of different nations, with products that must be judged on different standards, to determine comparable degrees of excellence. Indeed some of the best English manufacturers initially threatened to not submit exhibits; with little faith relative merit could be assessed fairly, they were concerned that if they lost out on a ‘first prize’ then their business and reputation would suffer. The Royal Commission concluded that their intention to encourage a range of industry and innovation did not suit individual competition and comparison: ‘It is the wish of the Commissioners to reward excellence in whatever form it is presented’. Rewards were therefore to be largely confined to the honorary distinction of a Medal, although there were some discretionary monetary gifts allowed as well in certain circumstances. Honourable Mentions and associated certificates were also issued. The Council Medal is one of the three medals initially conceived as prize awards for the Great Exhibition of 1851, all featuring reverse designs chosen by international public competition. 129 entries were received, exhibited and judged anonymously at the Royal Society of Arts. Three of these were awarded the prize of £100 and selected for the reverse of what later became the Jurors, Prize and Council medals. Complementary Latin inscriptions were chosen from classical literature by a committee including future Prime Minister William Gladstone. 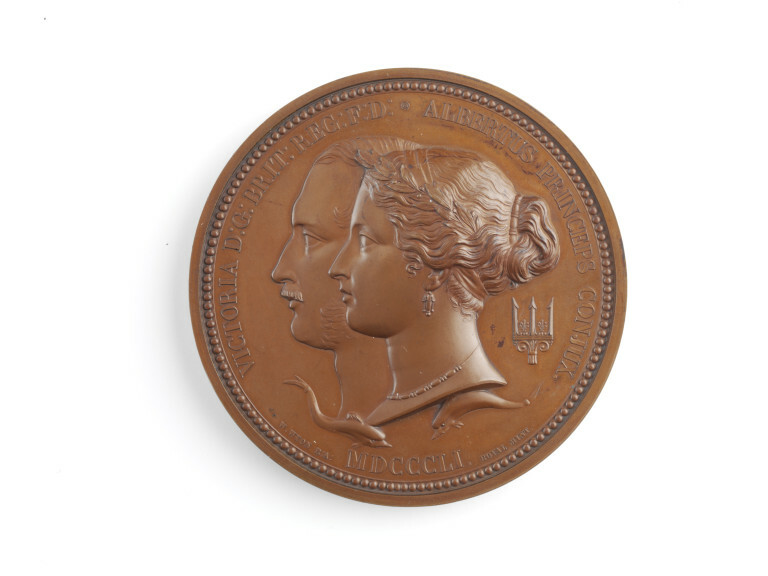 The obverse (front) design of the conjoined heads of Queen Victoria and Prince Albert was commissioned from William Wyon (1795-1851), medallist and Chief Engraver of the Royal Mint. The winning design on the reverse of this medal is by the French sculptor Pierre Hippolyte Bonnardel (1824-1856), executed by the medallist and die cutter Joseph François Domard (1792-1858). When the Jurors met they recommended two 'competitive' award medals only, for reasons discussed above, and added in ‘Honourable Mention’. The third medal was appropriated by the Commission so they could award these to the Jurors themselves for their massive undertaking. In addition they prepared 2 other medals: one for all exhibitors and one for those who have rendered service to the Exhibition. All exhibitors received the Exhibitors Medal, apart from those already awarded the more exclusive Council Medal or Prize Medal. The striking of the medals was awarded as a private commission to William Wyon. Four of the official medals were struck at the Royal Mint before he died, and it was his son, Leonard Charles Wyon, who completed the medal production for the Royal Commissioners. The hardened steel dies for the obverse and reverse of this medal were given to the V&A in 1921. They were used to strike comparatively soft round blanks of Bronze to form the medal designs cleanly and swiftly. William Wyon’s illness meant that the Official medals were not ready to be distributed at the closing ceremony of the Great Exhibition in 1851, and his subsequent death delayed the inscribing of the edges and the distribution of the medals to recipients. This particular example forms part of a leather-bound presentation set of seven medals given to Henry Cole, all inscribed with his name around the edge. Henry Cole was Prince Albert’s Chief advisor for the Great Exhibition of 1851 and involved in all aspects of its concept and execution. As far as we know this 7 medal set is unique, but similar commemorative boxed sets of 5 medals were given to the Members of the Royal Commission and a number of other Senior Officials involved in organising the Great Exhibition. They were also presented to the governments of other countries who took part in the Great Exhibition. Reports by the juries on the subjects in the thirty classes into which the Exhibition was Divided. Presentation Copy. London: 1852. Vol I Introductory, Awards, Reports, classes I-IV.